When I came across a story printed in the London Standard on 29 December 1845 concerning a collision of two steamers off the west coast of India I was intrigued. One of the ships, the Parsee, which was carrying a very large load of opium and treasure, was commanded by Captain Grisdale. So which Captain Grisdale was this? I will tell you later, but first the short story. ‘The “Parsee” was a little steamer employed in the East India country trade, owned by Messrs. Jeejeebhoy Dadabhoy, Sons & Co. and commanded by captain Griesdale. She was totally lost by a collision with the “Sir James Rivett Carnac”, captain P. Duverger, a vessel employed in the same service, but fortunately without loss of life. The “Carnac” was on her way from Bombay to Tankaria Bunder and the “Parsee” was returning by the same route, with a cargo of 525 opium chests, valued at three lakhs of rupees, as well as a large number of native passengers on board; she had taken 45 when she touched at Surat. The collision took place in about 20° north of latitude, and 12 miles from the shore, about 11 o’clock at night, on 29th of October, in about 17 fathoms of water. The night was fearfully dark and excepting the watch, all hands were asleep. It would appear that as both vessels had lights hung out, each was aware of the presence of the other, but unfortunately by mistake or ignorance , both altered their course in the same direction, and in consequence the “Carnac” ran into the “Parsee” on the starboard side, just abaft the foremast, cutting her side completely through. The foremast of the “Parsee” was carried away by the bowsprit of the “Carnac” and immediately fell on the deck among the passengers, but providentially without hurting anyone. It was at once perceived that the fate of the “Parsee” was sealed, and her passengers and crew took advantage of the contact of the vessels to rush on board the “Carnac” for safety. No time was lost in saving the whole of the passengers and crew, consisting of 70 souls; and just as the last man stepped out of her, the little steamer sank. The injury done to the steamer “Carnac” is trifling, her bowsprit was split and the bows injured. The London Standard also reported that £31,500 of coins was also lost. The British East India Company had wanted to find a way to pay for what they bought in China other than using silver. It hit upon the idea of taking opium grown in India to use to pay the Chinese. Large sections of the Chinese became opium addicts and Britain and France fought various Opium Wars with the Chinese to keep the trade open. The East India Company declared a monopoly on the trade in India which was pretty solid in Bengal and Calcutta but in the west their control was much less and various local Parsi merchants got in on the act. Jeejeebhoy Dadabhoy, the owner of the two steamers which collided, was one of these Parsis, hence the name Parsee, the ship commanded by Captain Grisdale. The other ship was named after a former Governor of Bombay Sir James Rivett Carnac. The whole history of this opium trade is fascinating but I’ll leave it here. So who was Captain Grisdale who had lost his ship and his opium? Was he perhaps Whitehaven-born Captain Joseph Grisdale who became a China Tea Clipper captain and died in Shanghai in 1859? Well I think not because Joseph only got his Master’s certificate in 1851. That leaves only one possibility: Captain Grisdale was the Workington-born mariner Edward Grisdale who had been part of the crew of the convict ship Numa taking convicts to Sydney. He married one of the female convicts in Parramatta Female Factory in 1835. He then became a steamer Captain operating out of Tasmania before disappearing from the records. I wrote a story called Edward Grisdale’s convict wedding at Parramatta and one about his father called Ferrying Troops and emigrants – Captain Edward Grisdale of Workington. 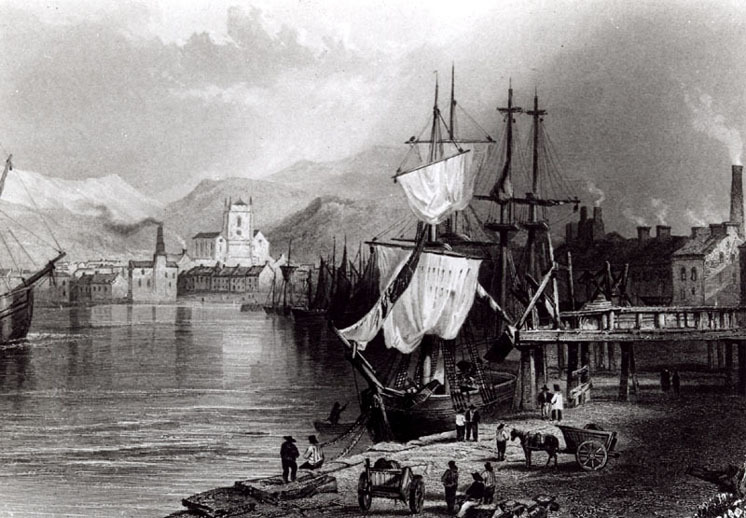 So it was Workington-born Edward who was part of the India to China opium trade. Didn’t the family get around!